I was notified yesterday that 5 prints of my artwork were sold through FineArtAmerica and will be framed and hung at the VA Hospital here in Tucson. Three of them were WS oils, 1 acrylic and one watercolor/pastel chalk. I'm really pretty excited. Wow, that is fantastic, Judy! Congratulations! I like it when art is displayed in areas where many people can appreciate it! The only problem I run into in FineArt America is that they have a hard time accepting that paintings are not as sharp as photos. I frequently get a note saying they are blurry when they look at sample spots at maximum magnification. They usually point out that the corner samples are not sharp, and I explain to them that you purposely do not make the perimeter sharp so you keep the viewer's eye in the painting. It gets to be very frustrating at times, especially when they do it on one which frequently satisfactorily sells and I have to repeat the whole explanation again before they print it. Oh, well. Hope your show is going well. thanks for taking the time out to comment. I am surpised that an art service would be making comments on the sharpness of images. It would seem like common sense that paintings have sharp and soft edges. Same with photos, with depth of field, and filters to help control the viewer's journey through the image. I can see them checking file resolution, to make sure the original file size is appropriate for good reproduction, but the other aspect starts to enter into 'editorial' suggestions. I can't comment much on the photography of paintings, since I am still a fledgling photographer. That's wonderful, Judy! What prints did they buy? They are lucky to have such a great local artist. Congratulations, Judy! It's so encouraging when an artist you "know" sells! Thanks Jan. Of course I've all ready spent all the money, but that's what it is for. That's my play money. I bought the Wacom Cintiq 13 HD for painting on the computer. I've been wanting one for a long time and they had it on sale so the price was just right. Essentially, I am now painting directly on the pressure sensitive palette which displays the painting right under your stylus, rather than using the stylus on the old palette and looking at the painting up on the computer monitor. I love it. It is just like putting the paint on a canvas right under your brush. Here is one that I have been working on for several months and did finishing touches and changes to the foreground on the Cintiq. I donate matted prints of area painting each summer in my home town. This one is along the Racquet River in town from a trail that parallels it. If any of you have suggestions for me, please feel free to tell me. I've struggled with this for quite a while because they want focus both on the trail and the kayaks. We have people come from all over US and Canada to participate in the white water kayaking events. Oh, Crystal, I never answered your question about which painting sold. They were all southwestern. Several where of gambel quail, one close up of a prickly pear cactus in bloom and a sunrise painting of the mountains here in Tucson. 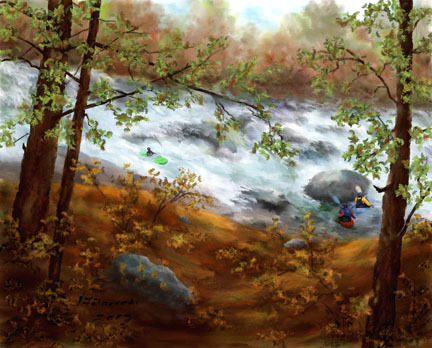 This is a nice work, but I find the colour of the kayaks a bit too pure. If they were more dull, slightly blurred, or 'atmospheric/covered in spray' they might not pop forward so much. The foreground leaves are quite lovely! Nice and Bright Judy.. Lovely. I agree with Alan about the Kayak's. Judy, I'm sure this will be popular as a print, Judy. I agree about the color also and wonder, too, about the scale of the kayaks. It's got to be hard to get both the trail and the kayaks though. I bought a new Intous Pro (wireless) but it's not working right and I'm very disappointed! I bought it from Overstock.com and their return policy is the pits so I'm keeping it for now. Wacom has not been of any help at all. Thanks for the commends. It has definitely been a challenge with the kayaks. They are not very far away from where you view them and they stand out very strongly against the white of the water. The green one is in full sun making it very bright. I think they purposely pick pure colors so they don't get lost in the busyness of the water and rocks around them. I grayed down the red one to put it in shadow and the man in yellow in partial shadow. Is it the green one or all of them that bother you. Although, they wanted focus equally on the trail, river and kayaks, that just didn't work for me. I put the white water and kayaks as the center of focus. I'm afraid that dulling them down would now make the river over power them and the foreground would become equal to the river. Oh well. I've worked on this for almost 3 months and it is specifically painted for the fund raiser. I think it is time to just call it a wrap and print the copies so I can mat them before I head back east. I've noticed in the preliminary prints, the colors are more subdued. Sorry, Jan, about the intuos wireless. I'm wondering if overstock.com doesn't sell ones that have been returned to Wacom because of problems. I'd still fight them on the return. They depend on people giving up so they can make their money. Don't you be one of them. I know quite a few people in our digital group that have the wireless and have bee perfectly happy with them. One thought, have you checked for driver updates from Wacom. I know that they have had several over the past 6 months and I'm sure overstock does not update their products. If you haven't, go to Wacom.com and got to drivers and updates. Hope tha helps. Regarding the kayakers, their vests and kayaks were catching my eye. Just a bit of fading of the intensity of the colour would do the trick. Best of luck with the fund raiser! I've looked at the printout from this version, and everything is more subdued. When the back light of the computer is removed, things look a lot different on paper. I'll give it a try today and let you know what happens. I'll be interested to see how the print out comes. Jan, You also hit the nail on the head. The thing that had been bothering me the most was the size of the man and kayak in the green. I realized that the reference photo I use was one where the kayak was originally back behind where I wanted to put trees on the left. I didn't take into account the moving him more to the center would also mean that the had to be larger. So here is the new version, The green kayak is larger, the man is larger and I also changed the position a little higher. I kept feeling like the other one was going to run into the rock. I splashed more water across the green on and actually accidentally go a neat wave pattern on his left. I toned down all of the kayakers colors with a wash of a gray-blue I picked up from the water. Hope this one passes the test from the three of you. I really appreciate your comments. AHggggg!! I sent it before I attached the picture. Here it is in the next post. I think you've got it, Judy. It looks better now and just feels better. As for returning the tablet, it's not that Overstock wouldn't take it back, it's just that they make it very expensive and difficult. Of course the first thing I did was update the driver and that was also what the Wacom tech suggested. Didn't help. The problem is that the tablet doesn't "wake up" when the computer does after sleeping. Aggravating but not unworkable. I agree. That green kayak was the one thing that always bothered me but Ijust didn't know exactly what it was until you mentioned it. So are we going to start seeing some of your digital work? I hope so.